A benevolent king used to give huge amounts of money in charity. His minister Surya Prakash understood the value of money and advised the king to donate wisely. One day, when Surya Prakash went to the river he saw a beautiful maiden perched on a floating branch of a tree. He swam across to meet her. She said she was a nag princes and that a wicked demon had captured her kingdom. He would set it free only if he was given another empire in return. The minister rushed back to inform the king about her. Pained by her tale, the king gave away his own kingdom and went underwater with her. 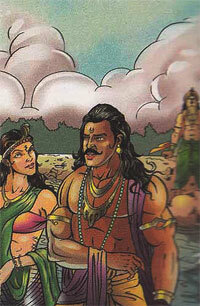 Surya Prakash blamed himself for the king's disappearence and killed himself. Now Betal asked , Who was really responsible ?" Vikram replied , "Surya Prakash , because as the king's minister he was aware of his master's overly generous nature, yet he told him of the princess's problem."